Dogsledding at Mt. Baw Baw is unlike any dogsled experience you have ever had before! So whether this will be your first time to the snow or you return year after year Mt. Baw Baw has it all. We offer up to 6 different types of tours among the maze of the back country trails to ensure we can give those of you who visit us on a continuing basis a new adventure each time! Dogsledding won’t be your only highlight on the snow. 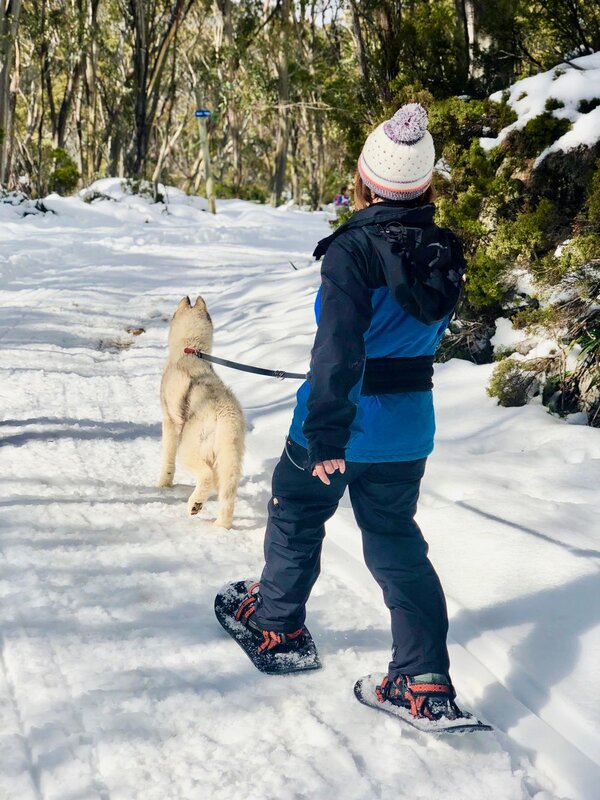 Mt Baw Baw has plenty of snow activities such as Powder Pup snowshoeing, tobogganing, skiing, snowboarding, cross country skiing and enough snow to make your own snowdog! After a great day in the snow Mt Baw Baw has plenty of warm restaurants and cosy accommodations in which to relax. A day trip to the snow is a great idea as Mt Baw Baw is only 3 hours away from Melbourne's CBD! We are looking forward to seeing you this season in Australia's own winter wonderland! Please note: there is a combined weight limit of 160kg for all sled tours. All of our tours are run as an informative, enjoyable and scenic tour, we do not offer an adrenaline rides. Although our dogs are amazing at what they do we train them as freight pulling dogs not a racing dog meaning they are extremely fit and extremely strong but not extremely fast. Come jump in a sled with a team of Howling Huskys for a tour you'll never forget! Named after the Mt. Baw Baw Dog Sled Dash dog race, this tour will take you for a dash around the Latrobe trail with one of our experienced mushers and a team of eight huskies. along the way you will learn about your team, their jobs and the traditions of the sport. To end it all off, come meet your team with lots of pats, cuddles and photos. A quick but exciting ride that is great for the kids. Approximately 15 minutes in the sled - 15 minutes of pictures, pats and cuddles. Hear the excitement of the dogs build as they get ready to take you on our Family tour. Jump in the sled and learn about the team of Howling Huskys you have running with you as our experienced musher educates you on the history and tradition of sled dogs. Along the way take in the amazing scenery and complete your tour with cuddles, pats and lots of photos. This tour is great for all ages! Approximately 15 minutes in the sled for each trip - 15 minutes of pictures, pats and cuddles. $320.00 for one family, 2adults 2 children. Come along on our Back Country tour as you are amazed by the strength and stamina of your team of Howling Huskys while out on the trail for an hour. During this tour you will get to know your team, from the smart ones to the cheeky ones. You will travel by dogsled amongst the snow gums and onto open plateaus. Take in the peacefulness of hearing nothing but the pitter-patter of the dog’s paws against the snow and the commands of your musher. If you’re feeling fit the musher might let you on the back of the sled. To complete your tour. Let one of our handlers bring you in to thank your team and answer any questions you may have while the dogs enjoy the tasty treat they receive when they return from the trail. Approximately 1 hour in the sled - 15 minutes of pictures, pat/cuddles, questions hook and unhook team. Your journey begins as you snuggle into the sled just before dusk and our team of Howling Huskys take you on an experience like no other in Australia! Sit back and relax as your large team begins the climb to summit of Mt. Baw Baw. Once at the summit take a break to meet the team and be overwhelmed by the breathtaking views of the surrounding Baw Baw National Park. Learn about the dogs, the history of dogsledding and the reasons they love doing it. Continue along the trail and come to a stunning look out where your musher will share some local knowledge with you and leave you to enjoy a complimentary wine as you watch the sunset (of course your team of Howling Huskys will be right behind you also taking in the view!). Be wide eyed by the beauty of Mt. Baw Baw's winter wonderland as you embark along the longest commercial dog sled trail in Australia. You are in for a howling good time as your guide and team of Howling Huskys takes you to the summit and beyond on this half day tour. We start with very excited dogs as they love to run in the chilly morning air. Brave the task of learning how to harness your team, their positions, then we hook up and the real fun begins. So simply rug up, jump in and hold on! First we head up the long hike to the summit of Mt. Baw Baw where your musher will tell you a little about your team, the equipment, the history of the sport and breed but most importantly how to MUSH! So pay attention as you will need all the advice you can get when it is your turn to drive. Enjoy the amazing open views before descending through the labyrinth of snow gums towards the back end of Mt. Baw Baw. Now it's your turn to jump on the back and hang on as your guide helps you to run your own team of huskies! After all that excitement we stop to enjoy the view with a campfire lunch and hot drink while warming our toes by the toasty fire. Before long the dogs will tell us it's time for the home run! With your new skills you have learned, feel free to practice and jump on the back with your guide. Once home, take all the time you need to thank your beloved team as their work is done for the day! Please note: We do need plenty of notice if you're wanting this tour so we can make sure we can have a team booked out for you to enjoy for the whole day . 4weeks notice is recommended. This tour is a fantastic opportunity to enter the world of a retired sled dog. Howling Huskys is a forever family meaning we do not rehome our retired sled dogs but just simply change their job. So come gear up with a pair of snow shoes and walking harness and let our senior sled dogs show you the beauty of their favourite trails. As you journey into the trees with only the sound of crunching snow beneath your feet, your experienced guide will show you the fun we have keeping our retired dogs fit, happy and healthy. This tour is great for all ages as and is based on keeping our dogs minds sharp and engaged. So make snow angels together or play catch with a snow ball or just embrace the gentle nature of these dogs while enjoying the view. Please note: children under the age of 13 cannot walk a dog. The minimum charge for a Powder Pup Snowshoe Tour is 2 adults - maximum group size is 8 people. Tour availability is limited so please book ahead. 0-45 minutes walking, 15-30 minutes fitting snow shoes and pat and play with dogs. Another exciting way to get amongst the snow gums and out to the Baw Baw back country or maybe up to the summit. Let us drive you on our snowmobiles a must do for any visiter to the snow! Please note, for all snow mobile tours you are a passenger you do not drive the snowmobile.